Cold Higham is believed to be the highest village above sea level in Northamptonshire. "COLD-HIGHAM, a parish in Towcester district, Northampton; 4 miles NNW of Towcester r. station, and 5 W of Blisworth. It includes the hamlet of Grimscote, and part of Fosters-Booth and Potcote; and its post town is Pattishall, under Towcester. Acres, 1, 660. Real property, £2, 767. Pop., 349. Houses, 83. The property is divided among a few. The living is a rectory in the diocese of Peterborough. Value, £467. Patron, J. B. Howes, Esq. The church is good." Cold-Higham, a parish in Northamptonshire, 3 ¼ miles NNW of Towcester station on the L. & N.W.R, and 5 W of Blisworth. It includes the hamlet of Grimscote and part of Fosters-Booth, and its post town is Towcester; money order and telegraph office, Towcester. Acreage, 1730 ; population, 330. The living is a rectory in the diocese of Peterborough; net yearly value, £300. The church, an ancient building of stone in the Norman style, contains an altar tomb with an effigy in oak of a knight in plate armour and surcoat, representing Sir John de Patteshull, who died in 1350. Ironstone is found. Cold Higham, so called from its exposed and elevated situation, is named "Hecham" and "Hecham Parva" or "Little Higham" in early records, and "Heca" in Domesday Book; together with Grimscote and part of Foster's Booth it constitutes a parish, about a quarter of a mile west of the old London and Liverpool coach road, 4 miles north from Towcester station on the Stratford-on-Avon and Midland Junction railway, 5 west from the Blisworth station on the main line of the London and North Western railway and 7 south-west from Northampton, in the Southern division of the county, hundred, petty sessional division, union and county court district of Towcester, rural deanery of Brackley (second portion), archdeaconry of Northampton and diocese of Peterborough. 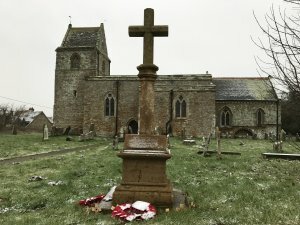 Some details of the Parish's history from Roman times, through medieval and more modern times can be seen on the British History Online website. The church dates from the 13th (tower) and 14th (main building) centuries. It is likely that there was an earlier church on the site. The church was Listed (Grade II) on 17 May 1960 (English Heritage Building ID 234664). Further information about the church is available on the British Listed Buildings website. The history of the War Memorial is currently being researched. It will be added shortly. These are the names of those who fell in the two World Wars, and who are remembered on the War Memorial.